Toxoplasmosis is caused by an intracellular obligatory parasite, Toxoplasma gondii, and it has global distribution. The purposes of this systematic review and meta-analysis were to evaluate the seroprevalence of toxoplasmosis in Iranian pregnant women, and girls and women of childbearing age, and identify potentially preventable risk factors. Between November 2014 and February 2017, nine electronic databases that reported data on the T. gondii seroprevalence in Iranian women were searched. Our search resulted in 83 reports published from 1994 to 2017. The results showed that the pooled estimation for the prevalence of T. gondii using a random-effect model was 43% (95% confidence interval (CI) = 38–48%) in pregnant women and 33% (95% CI = 23–43%) in girls and the childbearing age groups. There was a significant association between the T. gondii seroprevalence with age and the gestational age of conception in pregnant women and those who had contact with cats in both groups. This is the first comprehensive systematic review of T. gondii infection seroprevalence in Iranian women, which showed a high prevalence of Toxoplasma infection. Around 57% of pregnant women and 67% of girls and the childbearing age groups were seronegative and thus were susceptible to infection and should be monitored. Toxoplasmosis, a cosmopolitan infection in humans and animals, is caused by an intracellular obligatory parasite, Toxoplasma gondii . T. gondii is spread worldwide, as at least one third of the world’s population is infected . The broad geographic location of toxoplasmosis is associated with several risk factors such as the geographical climate, contact with cats or other pet’s faeces, nutritional habits, and location of one’s residence . The worldwide prevalence of antibodies against T. gondii varies from 30 to 60% in both developing and developed countries . Infection is acquired by accidentally ingesting oocysts in food, water, and soil contaminated with cat faeces or the consumption of raw meat containing tissue cysts [5, 6]. Toxoplasmosis can lead to life-threatening conditions in high-risk groups such as pregnant women, immunodeficient individuals (e.g. HIV-positive patients, organ transplant recipients, and patients with cancer) [7, 8]. Although T. gondii remains dormant in healthy individuals, exposure to parasites during pregnancy can lead to vertical transmission to the embryo . The incidence of maternal infection during pregnancy is 1–8 per 1000 pregnancies . A newborn exposed to T. gondii may develop congenital toxoplasmosis with microcephaly, hydrocephaly, blindness, spontaneous abortion, and stillbirth . It may also significantly reduce the quality of life in children who survive prenatal infection and affect the socioeconomic burden on the patient’s family and the government . It is important to determine whether infection occurs in the early stage of conception or before because women who have been exposed to infection prior to pregnancy are not at risk of having an infected child . Exceptions have been seen in immunodeficient mothers . Screening for anti-Toxoplasma antibodies in pregnant women and also non-immune girls of childbearing age is the mainstay for controlling and preventing congenital infection [9, 11, 14]. Because of its importance and the fact that T. gondii is ubiquitous, seroepidemiologic studies help establish the health policies of each country. 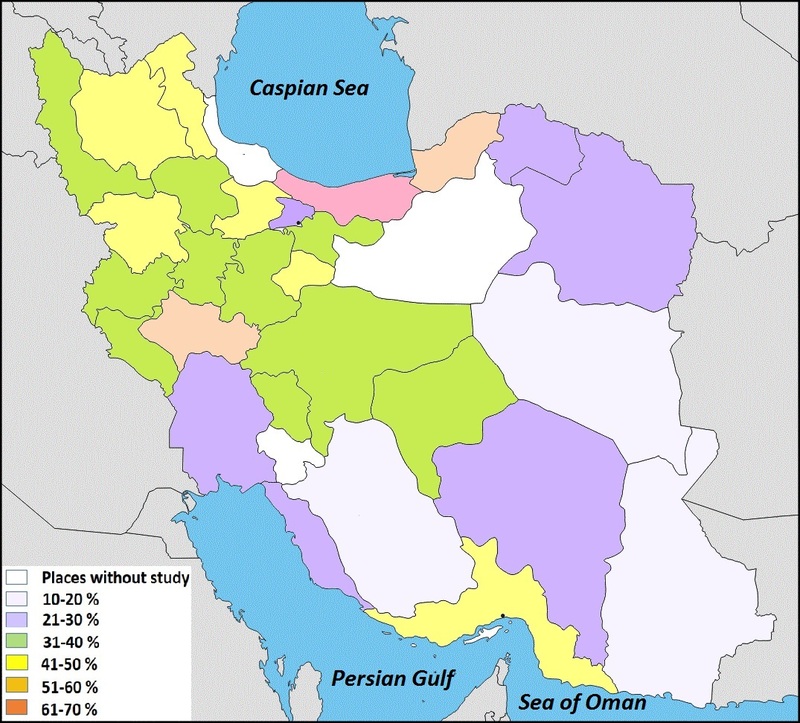 The purposes of this systematic review and meta-analysis were as follows: (1) to evaluate the seroprevalence of toxoplasmosis in Iranian pregnant women, (2) to estimate the prevalence of T. gondii in girls and women of childbearing age, (3) to identify the potentially preventable risk factors most likely to have the greatest impact on the incidence of Toxoplasma infection in pregnancy, and (4) to determine whether seronegative women are a high-risk group for toxoplasmosis that need specific control and prevention strategies to reduce the level of Toxoplasma infection. The following four literature search strategies were used in this systematic review and meta-analysis: (1) computer search, (2) study selection, (3) data synthesis, and (4) data analysis and quality assessment. Six English language databases (i.e. PubMed, ScienceDirect, Scopus, Google Scholar, ClinicalTrials.gov, and Cochrane Library) and three Persian databases (i.e. Scientific Information Database, Magiran, and Iran Medex) were searched from 1994 to 2017. The search was restricted to English- and Persian language databases. Medical Subject Heading terms and keywords included Toxoplasma gondii, toxoplasmosis, women, girl, pregnant women, childbearing age women, abortion, seroprevalence, seroepidemiology, Iran, and Islamic Republic of Iran. All citations were downloaded into EndNote. Abstracts were reviewed independently by 4 authors, and cross-sectional studies that estimated the seroprevalence of Toxoplasma infection in pregnant women, women of childbearing age, women with an abortion, student girls from a university or high school, and girls referred to health centres for premarital laboratory tests or a medical laboratory for routine tests, except T. gondii, were selected for further use. The final decisions about the inclusion or exclusion of studies were made separately after inspection. Discrepancies were resolved by discussion and consensus. In addition, the collected bibliographic publications were screened carefully, and duplicate articles, studies based in Iran, animal-based studies, and those with a specific population (e.g. the general population and all immunocompromised groups) were also excluded. A protocol for data extraction was defined with groups. Data were extracted from selected publications using a data extraction sheet by authors, and then, the data were reviewed by a third author. The following data were extracted from the literature: first author, geographical region, the year of publication, diagnostic method with the cut-off value, total individuals, number of immunoglobulin (Ig)G-positive and IgG-negative cases, number of IgM-positive and IgM-negative cases, and number of both IgG- and IgM-positive cases among the study groups. All information included demographic factors such as contact with cats and other animals, the consumption of raw fruits and vegetables, washing methods, the consumption of undercooked meat and unpasteurized milk, age, occupational group, education level, place of residence, number of pregnancies and abortions, and gestation age of the total individuals and positive cases. Whether the subjects wore gloves when cutting meat and had contact with soil was also collected. Figure 1 shows a diagram describing the study design process. The formula to calculate the population prevalence (weighed prevalence (WP)) of T. gondii in all groups or subgroups, included in this meta-analysis, was P = ∑ (pi) (1/vi)/∑ 1/vi. We used the metaprop command of STATA, version 12.1 (StataCorp, College Station, TX, USA), for pooling proportions. We estimated 95% confidence intervals (CIs) using the score statistic and the exact binomial method, and Freeman-Tukey double arcsine transformation of proportions via the ftt option. Forest plots were drawn to display the variation of the seroprevalence of the Toxoplasma infection test positivity rate among all studies together with the pooled measure and subgroup analysis. Heterogeneity of the prevalence estimates between studies was determined by the Q statistic and I 2 index, assuming that I 2 values of 25, 50, and 75% represented low, medium, and high heterogeneity, respectively. Therefore, we assess the quality of each study (Additional file 1: Table S1 and Additional file 2: Table S2). The influence of study characteristics (e.g. contact with cats and other pets; the consumption of raw meat, milk, soil, fruits, and vegetables; washing methods; age; occupational group; education level; place of residence; number of pregnancies and abortions; gestation age; the use of gloves when cutting meat; and study quality) was explored using subgroup analysis and meta-regression. Of 97,553 literature searches from nine databases, 83 records were eligible to include in this systematic review and meta-analysis. Thirty-eight articles reported results about the seroprevalence of toxoplasmosis in women and girls of childbearing age, 45 about the seroprevalence of Toxoplasma infection among pregnant women. Approximately all the studies included in this meta-analysis had a cross-sectional design. Of 40,117 individuals, 16,698 cases had Ig against T. gondii and were included in the meta-analysis, followed by 39,837 individuals, with 15,822 positive cases for IgG, 16,590 with 652 positive cases for IgM, and 5447 with 224 cases positive for both IgG and IgM. The prevalence of anti-Toxoplasma seropositivity in the girls group (i.e. women of childbearing age, high school girls, girl students from a university, girls referred to a health centre for pre-marriage examination, and non-pregnant women sent to a medical laboratory for examination) based on the random-effect model was 33% (95% CI = 23–43%). Figure 2 shows the forest plot diagram. About 67% of girls were seronegative and were not immune. The pooled estimations of IgG, IgM, and both IgG- and IgM-positive cases were 31% (95% CI = 21–41%), 5% (95% CI = 3–6%), and 3% (95% CI = 2–5%), respectively. Table 1 shows the baseline characteristic of the included studies. Data analysis showed that there was a significant relationship between Toxoplasma seropositivity and contact with cats (P = 0.04). Although the seroprevalence of Toxoplasma infection was higher among individuals who had direct contact with cats (30%); groups without contact with other animals (26%); individuals who consumed raw meat (34%), milk (45%), and fruits or vegetables (24%); individuals who washed vegetables or fruits with water (27%) and cut meat without wearing gloves (18%); individuals who had a low education level (63%); and those who were employed (53%) and were aged >20 years, there were no associations between these aforementioned factors and the rate of Toxoplasma infection. Table 2 shows the overall characteristics of the risk factors of the included studies. The pooled estimation for the prevalence of anti-Toxoplasma antibodies in pregnant women using the random-effect model was 43% (95% CI = 38–48%). Figure 3 shows the forest plot diagram. The data indicated that 57% of pregnant women were seronegative and were not immune during pregnancy. Table 3 demonstrates the baseline characteristics of the included data. The pooled estimates of IgG, IgM, and both IgG- and IgM-positive cases were 40% (95% CI = 35–45%), 3% (95% CI = 2–4%), and 4% (95% CI = 2–5%), respectively. In this group, there was a significant association among age groups (P = 0.004), contact with cats (P = 0.005), gestation age of the pregnant women (P = 0.001), and the rate of infection. Data indicated that although the prevalence of T. gondii infection was higher among individuals who had direct contact with soil (42%); consumed raw meat (41%) and fruits or vegetables (39%); washed vegetables or fruits with water (39%); lived in rural areas (47%); had a senior-junior high school education level (39%); and were aged >30 years (53%), there were no associations between these aforementioned factors and T. gondii antibody positivity. Table 4 shows the overall characteristics of the described risk factors. T. gondii has a wide range of distribution, and seroprevalence data indicate that toxoplasmosis is one of the most common human infections worldwide . Acute infection with Toxoplasma during pregnancy and its outcome for the foetus and newborn continue to occur in Iran and in other countries, despite the fact that it can be prevented. A large body of the research about the seroepidemiology of toxoplasmosis in women has been performed in Iran because of the great importance of T. gondii as a public health problem, but there is a lack of comprehensive systematic and documented data in this area. Among all nine databases searched from November 2014 to February 2017, 83 records involving 40,117 individuals and 16,698 cases containing immunoglobulin against T. gondii in groups of women were eligible to be included in this systematic review and meta-analysis. The present study showed that the seroprevalence of anti-T. gondii antibodies in Iranian pregnant women and women of childbearing age were 43 and 33%, respectively. A higher prevalence of anti-T. gondii antibodies was observed in previous studies conducted in Iran: 55% in patients who had received transplants, 50% in HIV-infected individuals, and 45% in patients with cancer . The prevalence of toxoplasmosis from a survey administered to the general population in Iran was 39.3% . The data indicated that the seroprevalence of T. gondii in pregnant women in Europe varies from 9 to 67% . Although some Asian countries such as Malaysia, India, and Nepal have the highest seroprevalence of Toxoplasma infection in pregnant women (41.8–55.4%), conversely, Korea and Vietnam report a low seropositivity rate of T. gondii (0.8 and 11.2%, respectively) [18–20]. In our neighbouring countries, Turkey and Pakistan, the anti-Toxoplasma antibody in pregnant women was found to be 33 and 19.25%, respectively [21, 22]. However, in Turkey, the seroprevalence of Toxoplasma infection in women of reproductive age was determined to be 58.3 and 1% for IgG and IgM, respectively . Toxoplasma infection’s geographical distribution is related to several environmental factors (i.e. food habits, variations in climate, and contact with infected cat faeces) and sociodemographic factors (i.e. age, occupation, education, and residence) . Any of these factors alone has little effect on the epidemiological status of Toxoplasma infection, but together, they can change the distribution pattern of the disease worldwide . The geographical climate is one of the main factors of the disease. Our country has an arid climate, but the weather condition is variable. Some provinces such as Tehran, Fars, Kerman, and Khuzestan have various climates. Thus, an epidemiologic survey in this part of Iran is more difficult to administer. This variation of climatic conditions can introduce biases into the prevalence rate of Toxoplasma infection. In the northern part of Iran (around the Caspian Sea), there is a high prevalence of T. gondii infection, whereas in cold mountainous and hot provinces, lower seropositivity rates are found. The right climate status in the northern part provides a suitable condition for oocyst sporulation and survival in the environment. In mild and wet climates, the maturation of oocysts and transmission to a new host happens [9, 25]. Additional file 3: Figure S1 shows the prevalence of total Toxoplasma antibodies in both girls and pregnant women in all parts of Iran. The abundance of cats is another risk factor of Toxoplasma infection. Domestic cats are one of the main sources of infection. Our results showed that the anti-Toxoplasma antibody in cat and other pet owners was higher than that in individuals who did not own or have contact with domestic animals in both pregnant girls and those of childbearing age. Similar findings were reported by other studies [26, 27]. Cats excrete millions of oocysts after ingestion of even one tissue cyst or bradyzoite. In the environment, sporulated oocysts can outlast for months or even years in moist soil. Terrestrial insects such as earthworms, beetles, and even flies can extend oocysts from the soil, which leads to food contamination. Cats may be infected when hunting small mammals contaminated by tissue cysts. They can shed a large amount of oocysts via faeces in the environment. Food, water, farms, and gardens may be contaminated by their oocysts. Keeping cats in the house (e.g. keeping them indoors or outdoors), especially in high-risk groups such as seronegative pregnant women who are susceptible to Toxoplasma infection, needs more consideration . Previous data have indicated that dog fur that has come in contact with cat faeces may be one of the factors of oocyst transmission to humans . In our study, T. gondii showed a higher antibody titre in individuals who consume undercooked meat, milk, vegetables, and fruits and washed them with water only instead of detergent in both aforementioned groups. Lopes et al. and Gelaye et al. showed the same results [26, 29]. The consumption of meat from domestic animals contaminated with tissue cysts is one of the main sources of infection. The risk of acquiring T. gondii via contaminated meat with tissue cysts varies between cultural and eating habits in various communities. However, meat is one of the major sources of Iranian meals; thus, the consumption of undercooked meat can lead to the transmission of parasites. There is a risk of Toxoplasma infection by consuming dairy products. Tachyzoites are orally infectious because they can survive in pepsin and trypsin. The consumption of milk containing tachyzoites in girls and women of childbearing age with no prior contact to the organism can lead to horizontal transmission and clinical infection. In seronegative women during pregnancy, the consumption of undercooked meats such as kebab (a meat product like sausage), dairy products, raw vegetables, and fruits can lead to congenital toxoplasmosis, which is a serious problem [9, 30]. Our data showed that the seropositivity of T. gondii infection among various occupations in both groups was different. In women of childbearing age and the girls group, the seroepidemiology of T. gondii in employees was a little higher than other jobs, but this difference was not significant. Our result was comparable to a study performed in Brazil, which showed a high prevalence of infection in this group . However, in pregnant women, antibody titres were the same in both groups. Women spend more time cooking, tasting foods during meal preparation, handling and chopping meat in the kitchen, taking care of pets at home, gardening, and cleaning and washing vegetables and fruits. This finding explains why the seropositivity of infection in individuals who have contact with soil during gardening and women who chop meat without wearing gloves is higher than that in groups who do not have exposure to soil and raw meat. In various parts of the world, T. gondii oocysts have been isolated from soil samples . Published studies have indicated that in women of childbearing age, by increasing the level of education, a rising trend in T. gondii seropositivity was observed. Evidence from a study by Hung et al. supported our finding . The authors suggested that women with an academic education should have more knowledge related to Toxoplasma biology and its prevention and control strategies. The lack of effective information about this disease such as the route of transmission during pregnancy and poor socioeconomic status can increase the risk of infection. The seroprevalence and serologically positive cases increased by age in pregnant groups. Nimiri et al. demonstrated that a higher seropositivity rate was seen in older age groups than in younger age groups . The reason for this has not yet been discussed and it is not clear, but authors suggested the following reasons for infection: the prolonged exposure to the risk factors, transmission route, and lack of public awareness about preventive methods. In the current study, the seroprevalence of T. gondii in pregnant women who lived in rural areas was higher than those in urban areas. In 2009, Lopes et al. found similar results with our findings . During the first trimester of pregnancy, the risk of acquired congenital infection and impact on the foetus is 10–15%. However, in the second and third trimesters, the risk of foetal infection increases (60–90%) and also the effects on the foetus are milder [30, 33]. In the present study, the seropositivity rate of infection in the first trimester of pregnancy was higher than that in the second and third trimesters. In all women during conception, ideally in the first trimester, a serological screening test for T. gondii IgG and IgM detection are feasible . This kind of screening helps clinicians detect seroconversion individuals and provide early treatment for infection . In our study, multi-gravid women had a higher prevalence of T. gondii infection, and the prevalence was proportionally increased with an increasing number of children. Null gravid women had a prevalence of 41%, whereas women with more than one child had a prevalence of 53%. Our results showed a trend towards an increasing risk of positive T. gondii antibodies with increasing parity. In our study, the rate of anti-Toxoplasma antibodies among women with spontaneous abortion was 44%. This finding is in agreement with reports from Taiwan and Ethiopia [29, 31]. The most commonly used serological method of available data on T. gondii epidemiologic survey in both groups was ELISA. ELISA is a quantitative and inexpensive tool with a sensitivity and specificity of 100 and 98.4%, respectively . The second common serological method is IFA (sensitivity, 95%; specificity, 96%). Albeit IFA is cheap, manageable, and safe, it is a manual tool and ultraviolet light microscopy is needed . Additional file 4: Table S3 and Additional file 5: Table S4 summarize the characteristic of methods used in the included studies. The prevention and control of Toxoplasma infection rely on sufficient information about parasite epidemiology. The knowledge on T. gondii seroprevalence, risk factors, and prevention strategies can lead to efficient incidence reduction . The general population knows little about congenital toxoplasmosis and the risk of disease. Awareness of the risk factors of toxoplasmosis makes it possible for health authorities to define specific preventive strategies for high-risk populations. Primary prevention includes educational materials that contain the routes of how to prevent infection in women during pregnancy, which have resulted in reducing the prevalence of the seroconversion population. Secondary prevention includes serological screening. The transmission of T. gondii to the foetus always happens during or before conception. In healthy women with previous infection, transmission to the foetus rarely occurs . In both IgG- and IgM-negative cases, there is no serologic evidence of prior exposure to T. gondii, and the risk of congenital toxoplasmosis is high. Thus, they require serial testing during gestation. Anti-Toxoplasma IgG-positive women should be tested for the IgM antibody, and in IgM-positive cases, confirmative tests are needed. In women with IgG-positive and IgM-negative antibodies, the gestation age is very important. In women at <18 weeks of gestation, it means past infection and the risk of congenital toxoplasmosis is zero. However, in women at >18 weeks of gestation, it is difficult to predict whether exposure happened in the past or during conception. In anti-Toxoplasma IgG-negative and IgM-positive cases, a serological test should be repeated after 3 weeks. In this group, two conditions can occur: the antibody titre persists (IgG− and IgM+) or the IgG antibody changes to positive (IgG+ and IgM+). Management of the first group is the same as that for IgG− and IgM− patients, and in the second group, seroconversion occurs. In this group, the risk of T. gondii transmission to the foetus is high, and treatment, amniotic fluid polymerase chain reaction, and ultrasound should be performed . The results show that there is heterogeneity across the studies as illustrated by the forest plot. The dissimilarity, sensitivity, and specificity of several methods used in various studies, differences in the sample size, nutritional habits, and environmental factors such as the geographical climate can result in this heterogeneity. There are many studies based on the seroepidemiologic survey on women with toxoplasmosis in Iran, but there has not been a comprehensive systematic and documented report on this topic, except two articles on the epidemiology of Toxoplasma in women, which were not comprehensive [10, 38]. The present article fulfils this gap. Our systematic review and meta-analysis has certain limitations. The major limitations include the following: (1) there was no uniform sample size, (2) different methods with various sensitivity and specificity were used, (3) and the epidemiological results were heterogeneous. These aforementioned factors may have biased the prevalence of Toxoplasma infection in the population of Iranian women. This is the first comprehensive systematic review and meta-analysis of T. gondii in the overall population of women in our country. The data showed that 57% of Iranian pregnant women and 67% of girls and women of childbearing age were seronegative for Toxoplasma and susceptible to acute infection. Seronegative women are a high-risk group for congenital toxoplasmosis and should be monitored. We suggest that peer-led educational activities such as seminars and workshops are very effective, but they require great organizational efforts and lots of money and time. In Iran, there is no screening programme for women or seronegative pregnant women during gestation, but spouses are referred to health centres for premarital laboratory tests. It is necessary for the Ministry of Health to establish a screening programme and training course for couples who are referred to counselling departments for pre-marriage examinations. The risk factors for Toxoplasma should be documented in pamphlets and brochures with illustrations to make them easy to understand. However, didactic videos may serve as an effective teaching tool in these places. Importantly, health care organizations need to implement vast seroepidemiologic surveys on Toxoplasma infection in women and the disease risk factors using standardized methods, an identical sample size, and unique risk factors, to determine the true seropositivity rate in all provinces. The authors thank the Deputy of Research and Toxoplasmosis Research Centre (TRC) of Mazandaran University of Medical Sciences, Sari, Iran, for their kind provision. All authors made a substantial contribution to this review. AM, AD, and MS participated in the study design. SS, AA, AS, SAH, and MTR participated in the data collection and literature searches. AM, AD, AAP, MS, SS, AA, AS, SAH, and MTR were involved and contributed to the data interpretation. AM, SS, and AA contributed to the creation of the figures and tables. AAP and AD participated in the data analysis. AM involved in the drafting of the article. AD, AAP, MS, SS, AA, AS, SAH, and MTR contributed to the critical revision of the article. All authors approved the final article for intellectual content with approval for publication with agreement towards accountability for all aspects of the article in regard to accuracy.